Let’s look at one of the clear symbolic meanings of this passage above. 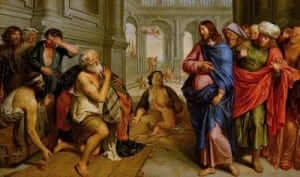 The man Jesus healed was paralyzed, being unable to walk and take care of himself. Others neglected him as he sat there by the pool, hoping for kindness and attention. Jesus sees him and gives him His full attention. 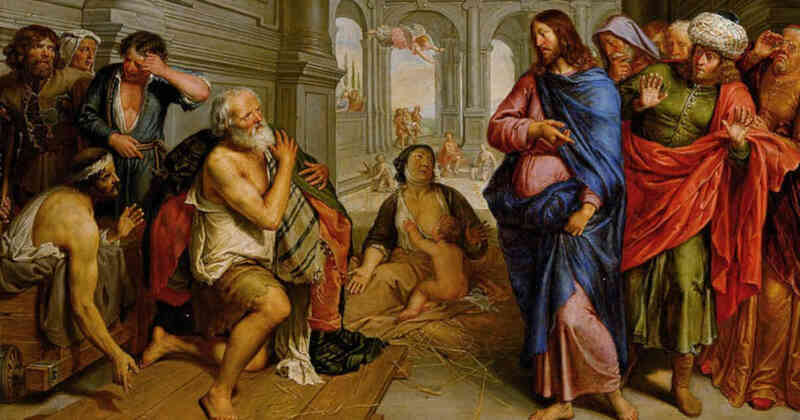 After a short dialogue, Jesus cures him and tells him to rise and walk. One clear symbolic message is that his physical paralysis is an image of the result of sin in our lives. When we sin we “paralyze” ourselves. Sin has grave consequences on our lives and the clearest consequence is that we are left unable to rise and then walk in the ways of God. Grave sin, especially, renders us powerless to love and live in true freedom. It leaves us trapped and unable to care for our own spiritual lives or for others in any way. It’s important to see the consequences of sin. Even minor sins hinder our abilities, strip us of energy, and leave us spiritually crippled to one extent or another. Hopefully you know this and it is not a new revelation to you. But what must be new to you is the honest admission of your current guilt. You must see yourself in this story. Jesus did not heal this man only for the good of this one man. He healed him, in part, to tell you that He sees you in your broken state as you experience the consequences of your sin. He sees you in need, looks at you and calls you to rise and walk. Do not underestimate the importance of allowing Him to perform a healing in your life. Do not neglect to identify even the smallest sin which imposes its consequences upon you. Look at your sin, allow Jesus to see it, and listen to Him speak words of healing and freedom. Reflect, today, upon this powerful encounter this crippled man had with Jesus. Put yourself into the scene and know that this healing is also done for you. If you have not done so already this Lent, go to Confession and discover Jesus’ healing in that Sacrament. Confession is the answer to the freedom that awaits you, especially when it is entered into honestly and thoroughly. Lord, please forgive me for my sins. I desire to see them and to acknowledge the consequences they impose upon me. I know that You desire to free me from these burdens and to heal them at the source. Lord, give me courage to confess my sins to You, especially in the Sacrament of Reconciliation. Jesus, I trust in You.